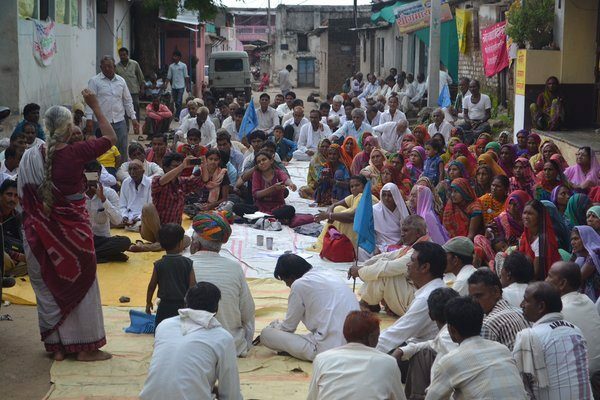 14th August: As the Narmada Jeevan Adhikar Satyagraha entered its 3rd day on the banks of the holy village Rajghat in the town of Badwani, participation of the affected oustees on the one hand and support for the protest from various quarters increased. About 40 recipients of the Right Livelihood Award, prominently known as the Alternative Nobel including many eminent citizens from India such as Swami Agnivesh, Dr. Vandana Shiva etc. issued a “Call for Justice” and an Appeal to the Government of India, the United Nations, & its allies to review the Narmada mega-dam project & adhere to binding human rights norms [Appeal enclosed]. They called upon the “Government of India to immediately halt the ongoing construction of the Project, and not to put up gates on the Sardar Sarovar Dam, since the urgency for a review of the actual status of rehabilitation and environmental compliance seems more necessary at this stage. Such a review must involve all the concerned government agencies, the UNHRC, representatives of the people’s movement in the Valley raising the cause of displaced over the past 3 decades, members of the civil society, experts, & independent social & human rights bodies”. Speaking to the oustees Himanshu and Pratap from Yuva Kranti, Delhi reminded that the NBA has been a beacon for numerous movements across the country and the issues raised by the Andolan have implications for the entire nation. They condemned the assault on the dignity of the farmers and livelihoods of the poor and conveyed full solidarity with the people’s struggle in the Narmada valley. Kailash Lambodia, from CPM, Indore came down heavily on the anti-farmer approach of the Modi-Shivraj Govts. He called for a united struggle by the farming and working classes in the Nimad region as well as across the country to change the present lop-sided paradigm of corporate loot of natural and human resources. Advocates Umesh Patidar and Kamal Patidar exhorted oustees to effectively utilize the forum of the GRA for redressal of their grievances, even as they acknowledged the changing nature of the Authority and the enormous procedural difficulties, delays as well as large-scale non-compliance of the Orders of the GRA. The highlight of the day was the standing ovation given by all supporters and oustees to the firebrand fisher couple Saava and Bharat from Pichhodi, who fought for their rights and obtained an Order from the Grievance Redressal Authority that the “displaced persons fishing co-operatives” must be registered. They brought tears to eyes of one and all as they spoke of the everyday fight and plight of thousands of fisher people thriving on the banks of Narmada. Hilly adivasis from Kharya Bhadal stated as to how while 10 oustees have been given cultivable land worth 2.5 crores, after decades of struggle, 60 others of the same village who are adult sons or left out of the official lists due to faulty surveys are yet to get land. “NVDA has been committing gross atrocities on the adivasis, said Gemtiya. Oustees send village – wise letters to Prime Minister: The oustees from village Semalda and Nisarpur wrote letters to the Prime Minister from the satyagraha site in which they asked him to review the decision to submerge the villages, since hundreds of families engaged in fishing, labour work, farm work, small trade etc are yet to be rehabilitated as per law, but have already faced submergence in the previous years. They also expressed grave concern on the irrational back water calculations, which has no relevance on the ground, risking the lives of thousands of families. Poor dalits, encroachers from Aavli-Segawa, mostly women said, “We shall fight for our rights till our last breath”. Medha Patkar and other activists spent the day with the women and men from different villages, listening to and recording the cases of delays, illegalities and denial of R&R. Medha said that “Even as the oustees would observe “Independence Day” on the 15th August, at Rajghat and Bhilkheda, Badwani and in every village by flag hoisting and also by taking a Sankalp on the river bank, sustained struggle for the real independence in the hills and plains of Nimad and rights of the natural – resource based communities shall continue through the Gram Sabhas. Water release from upstream dams and water level increase in the SSP reservoir downstream is being watched closely. The Andolan has called for an “Azadi Utsav” on the 16th August, where the rich agricultural produce and indigenous seeds, facing submergence, would be displayed and celebrated.